• PLOT SUMMARY: The time is 1997. The place is Great Britain...and things have never been worse. It's a time of brooding darkness, chilling despair and oppressive tyranny. The time for V for Vendetta. Who is the mysterious V? Is his wrath aimed at the fascist rulers gripping Britain in their iron grasp...or are his motives more complex than any reasonable person can hope to understand? 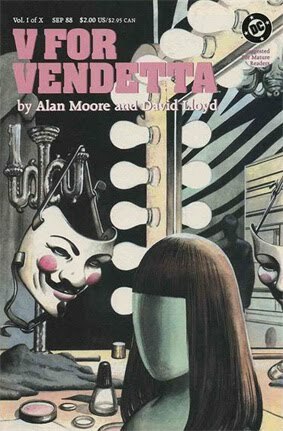 Welcome to the dark world of Alan Moore and David Lloyd's downbeat thriller, originally published in black and white in the British weekly comics magazine Warrior. Now, presented for the first time in this country, V for Vendetta debuts in full color. V for Vendetta is a 10-issue Deluxe Format maxi-series, featuring all the original episodes from Warrior and, beginning with the eighth issue, all-new material and the long-awaited finale by series creators writer Alan Moore and artist David Lloyd. David will also be coloring V for Vendetta for its Deluxe Format debut, as well as providing all-new covers.